Okay. 0.15.16 was silly; it wasn’t building the map at all; neither on the CPU nor on the GPU. Now fixed. Let’s all just pretend we didn’t see this little screw-up, okay? Thanks! Apologies! It should be a proper test, now! Fixed a crash if you selected a building tool and then clicked on the map before selecting a specific building type from the palette on the left side of the screen. Destroying scenery or functional buildings now causes them to visibly de-rez, instead of simply vanishing. (This same fix still needs to be done for set dressing buildings). edit: oops, posted a little early! This build is still about five minutes away. Soon, soon! edit, parte the second: And… now live on Steam! Thanks for your patience! Placing paths and network cables works again! I mean, technically it already worked in build 0.15.18, but it was failing inside any region which had either ‘mountain’ or ‘chasm’ as one of its terrain types, because the terrain data didn’t exist on the CPU, and so the computer just figured that there might be a mountain in the way, and refused to place paths or cables, just in case. With that, I think GPU-based map building is pretty much set! There’s still some cleanup to do and some general optimisation (particularly of a couple stutters happening during the loading screen), but barring any major new bugs being discovered, my focus is now back on new game features! Woo! I know I said that I was done with the GPU map updates, but I had just a couple more things I wanted to do before moving on. Smooth map editing! When editing the map, the map now smoothly morphs into its new shape, instead of “popping” into shape. And… faster! Moving the grass generation to the GPU means that I don’t need to pull nearly as much data back to the CPU during terrain edits; we’re now pulling back only about 30% as much data as in build 0.15.19, which makes editing the terrain even faster than it was in the past few builds! Fixed a crash bug which could occur when loading or saving a game in which any subscribers had had particular thoughts. Big thanks to @yxxxx2003 for reporting it and providing a saved game that showed the problem! Global TODO List! The game now provides a short list of tasks to do, in the top right corner of the screen. These are very simple goals to aim for; more subscribers, higher-level players and higher-level regions to support them, etc. There is no direct reward for meeting these goals yet, so don’t stress about them too much, but that’s coming! Terrain brush improvements! Previously, when using the terrain type brush, the visualisation worked as if the brush was going to change things, even if you had the brush over the same terrain type as would be painted down. Now we disable that change visualisation when clicking the mouse wouldn’t actually lead to any changes! More terrain brush improvements! Previously, placing mountains would often lift adjacent terrain enough that your cursor would drift over more terrain, and if the mouse was still down the mountain would spread to that new location. Now we only re-apply the terrain brush while the mouse is down if the cursor is moved a few pixels while the mouse is down. Text floaters fade out again! Fixed a bug which caused text floaters to remain solid and just vanish suddenly, instead of fading out nicely over time. Ambient occlusion flickering fixed! On some computers, there was some subtle (or not-so-subtle) flickering when SSAO was enabled in the video settings. This is now fixed! Ambient occlusion on set dressing fixed! Set dressing buildings weren’t receiving ambient occlusion correctly. Now fixed! In the Todo list, you’re now told to “set up” a new region, instead of being told to “setup” the region! That counts as a quality-of-life fix, right? Lighting fixed in 3D UI views! Half the 3D UI views were backlighting their contents, which made characters and buildings in palettes appear quite dark; that’s now fixed, with lights moved around to the front! Finally fixed the Giant Triangular Shadow of Doom on the ocean, off the west side of the map! I don’t really have anything else to say here. There used to be a giant triangular shadow over there which wasn’t coming from anything, now that shadow isn’t there any more. Yay, shaders! No longer gain 100 build points for setting up a new region! You now only gain a free 100 build points for the first region you set up, not for every region you set up; sorry for the nerf! Fixes a crash which would occur whenever saving or loading a game which contains a quest that sends players to a potion shop or a loot shop. New models! There are a few entirely new character models; the wolf, the troll, and the probably-a-trademark-violation-and-needs-to-be-renamed blood elf. Applying different skeletons to models now works properly! You can now, for example, take the ‘Paladin’ model and tell it to act as a quadruped, and all the animations work! Someday in the future, edit character colors! No UI has been built for this yet, but this build integrates the necessary rendering technology to change the colors of your characters. Expect that to be coming, soon! NOTE: Because of the new character rendering technology and the new animation rigs, all of the characters in existing saved games have become invalid. When you load a saved game from an earlier build, it will reset each of your characters to the default character shape for whatever costume you most recently applied to them. This means your characters in old games won’t appear broken, but they’ll lose any customisations to individual body parts you may have made. Hopefully I shouldn’t need to do this again in the future! Lower map regions into the sea! (Or raise them back to the surface!) The eponymous feature of this build is a pair of new tools on the ‘Grid’ tab, which allow you to raise and lower regions from under the sea. Note that only inactive regions can be lowered! Right now, this functionality is completely free! Move terrain around as you like! Smaller, more numerous regions! In new games, we now generate regions as about 2.2 square kilometers in size, instead of about 4.0 square kilometers in size (although these do still vary a lot from game to game). This means that there tends to be more available regions on a map, and those regions tend to be a little bit smaller. Woo, tails! We’ve added “Tail” as a new standard costume part. This isn’t yet editable, but tails are now animated, and it’ll soon be possible to attach a tail to any character type who doesn’t already have one, or swap or remove the tail for any character type who does. Hope you like mushrooms! The giant mushroom scenery models have been replaced. The new models look better (IMHO), and are also substantially faster to render! Mages with weapons! The mage now actually gets a visible weapon model, when weapons are acquired. No more grassy roads! Previously, if you laid a road through a desert or other grass-less terrain, a small amount of grass would be generated around the road. This is now fixed! Ignore alerts! Fixed a crash which would happen if you quit the game while you had an alert details window still open on the screen. Cursor stretch! Or rather, less stretch. The cursor now doesn’t stretch as far, when you’re making rapid cursor movements. Fixes a crash which could occur when creating a new game, if the game randomly happened to pre-generate certain models as the defaults for characters in the game. Place flight points! This is the flagship new feature in this build; place flight networks onto your map; your players will use them to get around more quickly! Caveats: Flight points are buildings, and can have prices set on them, but those prices are not yet being paid by the subscribers who use them, or considered when choosing a path to take to reach a desired destination. In this build, every player magically knows where all flight points are all the time. That probably shouldn’t be the case! Flight paths can be used to travel between regions, instead of using mountain passes. Flight paths are placed almost exactly like walls, except that they can’t be split in the middle. You can orient the flight points by click-drag-releasing the mouse as you’re placing the start and end of the flight path. Like with walls and roads, you can have many flight paths all feeding into a single flight point. Finally, in the full game you won’t start with access to flight points; I’ve unlocked them from the start in this build so that people can test them easily! Take manual control of enemies! There’s now a “Control” ability on the Interact tab. Click it, and then click-and-hold on a character to take direct manual control of that character! Notes: Monsters will be more powerful when you control them. Players do not yet react to you taking control of them, but that’s coming before the Milestone 16 build! Grass! Fixed grass to appear correctly everywhere, instead of vanishing under the terrain on particular slopes. Get less lost on roads! Fixed a whole bunch of bugs in the logic players were using to follow roads. Spiffy costumes! Updated a whole bunch of models and animations, also reduced the memory usage of character models by about 30%. Rezzing Crocodiles! Fixed the rez-in effect to start and finish correctly on characters! Previously, it often started rezzing in late, and sometimes the effect just entirely turned off before it had completed. This was particularly noticeable on quadrupeds, and especially the crocodiles! NPCs and Monsters no longer get bored! Previously, monsters and NPCs would occasionally jump while walking a long distance; only players do that, now. Progress bar placement improved! We now do a better job of placing the progress bar which is displayed while destroying an object, so that it doesn’t obscure the object you’re interacting with as much. Adjustments to GUI colors! It was still too close to Solarized-Dark, so I had to touch it again! Look me in the eye when you say that! Players, monsters, and NPCs all now turn to face their targets during an attack, even if the monster is behind them, and even if the player is controlling them at the time. Do little things like this belong in a changelog? The animated cursor now glows somewhat less when stretched. Or rather, the total amount of glow remains the same, it’s just spread out over a larger area! More Memory! Fixed a very small memory leak on exit if your game had a Real Money Shop in it. Note that you can’t currently place a real money shop (and haven’t been able to for a very long time). But if you happened to have one lying around in a very old saved game and loaded it up, we were leaking about a hundred bytes of memory each time you quit to the main menu. I’m not even sure why I bothered to mention this one. Pseudo-random number generator upgraded from xorshift to xoshiro. This is very exciting, if like me you’re excited about random numbers! Fixed a crash if the user clicked on the “Global” task group. Some little cleanups after yesterday’s build. There’s nothing really exciting in here! Squelch mouse clicks during the transition from game back to the title screen. This prevents the user from clicking on objects while we’re unloading them! Fixed the map ground geometry when creating a new game. When creating a new game, we were building the map ground geometry approximately 2.5% smaller than it should have been, which caused the map ground to not correctly match up against other objects on the map (grass, buildings, characters, water, etc). This only affected new games; if you saved and then re-loaded that save, the ground was rebuilt at the correct size. Fixed characters sliding on their butts instead of jumping, if they had ever travelled on a flight path. Monsters walk! Fixed a bug which caused monsters and NPCs to play their idle animation while walking, instead of playing a walk animation. Sticky players! Fixed a bug which occasionally caused players to become confused about what road they were on, leading to them becoming stuck in place. Improved pathfinding! Players now path to their destinations more intelligently, potentially using multiple road networks or flight path networks to reach their destination. Lots of optimisations to pathfinding! It’s still slower than it used to be, though, with the extra smarts added. Please let me know if it causes noticeable frame rate hitches for you! Fixed targetting of roads Roads can once again be targeted for destruction, instead of only the intersections between roads. Fixed UX around flight paths Flight paths and flight points can now be targeted for destruction, and behave properly in the UI as you mouse-over them. …and various other bug fixes! Quests to NPCs! You can now create quests which send players to other NPCs. Most notably, you can send them to kill a specific elite monster, or to visit another quest-giver. This is not a MOBA! Previously, only the player who struck the killing blow on a monster got XP for the kill. Now, every player who hurt the monster gets XP when the monster is killed. Defeat Bob! 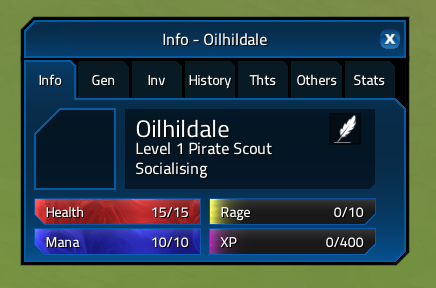 Elite monsters can now be given unique names! Players react to being taken over! If you take over manual control of a player, the subscriber now notices and has thoughts about it, and about what you do while controlling them. Don’t target the region! When you’re in control of a character, you can only select combat targets; not the region or buildings or other items. All fall down! Monsters now play a death animation, when killed. EDIT: Oh, and I forgot my favourite change! Select exactly the person you want to! I’ve rewritten the way we check for collisions between the mouse and animated characters, so it’s far more accurate than before! Now you can pretty reliably select exactly the character you wanted out of a big crowd! Players stay where you put them! There was a bug in the last several builds which caused players to sometimes teleport back to where they had been, if you took over control and walked away, and then released control. No more teleporting, now! Bugs are only positive! “Known, unfixed bugs” display no longer breaks and goes negative after a load. Similarly, the “Bugs fixed so far today” display also now works after a load. Editable property panes can be edited! Fix for a bug which caused editable property panes to not update when you typed into them. Stop, stop, he’s already dead! If a combat-capable entity is already dead, don’t try to apply more damage or other status effects from attacks already in-flight. Visible Windows! Fixed a bug which caused windows to fade to black if you dragged them away from their starting position, introduced in build 0.15.29. Elite monsters come back! Fixed a bug which caused elite monsters which were placed outside of a monster zone to never respawn. Now they DO respawn! Additionally, unlike normal monsters, elite monsters don’t mind respawning right on top of players; this means they’ll still respawn, even if players are sitting on top of the spawn point, waiting for that respawn. If you prick us, do we not serve you complimentary continental breakfast? Small inns now count as inns, for the purpose of completing region setup tasks. Just a few important bugfixes in this build. Click on characters! Fixed a bug which caused some people to be unable to click on any characters; players, monsters, or NPCs. Less generously shared XP! Fixed an exploit where a player could punch a monster once and then run away until the monster lost interest, but still get kill credit when another player killed the monster in a different combat later. 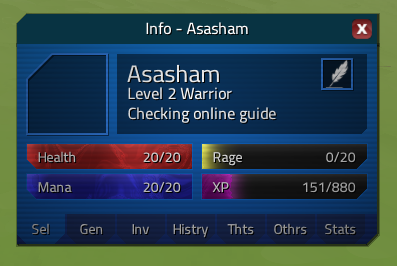 Now the player only gains XP if they did damage during the same combat in which the monster was killed. Getting closer to milestone 16! At this stage I’m predicting THREE more builds before milestone 16! -Hats! This… is actually another one of those “this is exciting but not totally available yet” features; character hats are now technically removable and interchangeable between classes, instead of being welded onto the ‘head’ piece of the class costume. Want your warriors to go into battle without helmets? That’s doable! Want your wolves to sport a fancy chef hat? That will work too! Tools for this will become available at the same time as character color editing, when the new character editor goes live in a near-future build. But… I was excited enough about this that I wanted to point it out now, since the tech behind it now works! New scenery! Several new scenery items have dropped. My favourite are the new snow-spike trees, but there are several more! These are not yet tied to any terrain types, so the only way to get them is to place them manually, but tying them to new terrain types so that they get placed automatically is coming! What’s in a name? Rewrote procedural region naming. In a new game, regions are now given (in my opinion) much better names than they did before. What’s in a name? (part 3) The game’s name is now displayed in a much more epic font, and bigger on screen, and more legibly against bright backgrounds! What’s in a name? (part 4) A region’s name is now displayed for a short time near the top of the screen when you move your camera close to the ground within a region. Nothing’s in my names Added a game option to disable the new region name display from the point above, in case it bugs you. OMG what’s that in the sky?? Fixed digital elements from the load briefly appearing in the sky if you zoomed down to ground level immediately after the load completed. OMG what’s that in the title screen?? Fixed the digital plate to appear correctly during the return-to-title-screen transition, even if you quit back to the title screen immediately after the load finished. … plus various optimisations and other bug-fixes, as usual! Miscellaneous bug fixes from 0.15.33. This build is all about the window dressing; the UI theme! Plus a few minor bugfixes. But in general, this build contains no functional changes; it’s only UI aesthetics! Unless something major is found by testers, this is the last build before the Milestone 16 build! Assuming now bug reports, all I’m expecting to change between now and MS16 is to add some new button icons and scenery/building models. Tails! Add a tail to any character! Character color editing! Want your players’ armor to be made of gold? Now you can recolor it! Fixed highlighting of action bar buttons. TODO list now moves to the correct location if the game resolution changes mid-game. Fixed window tabs briefly becoming detached from their windows during window transitions. Textedit selection highlights now correctly cover glyphs with descenders. Removed “VectorStorm Presents” logo from the loading sequence when creating a new game. …in all, there were 139 commits between the last build and this one! This build fixes a crash bug which could occur during a load, related to the new character editing interface. This is a bunch of little bugfixes. Nothing terribly exciting in this build! Fixes buttons used for editing character combat abilities, which had been unresponsive. Fixes buildings not showing their destruction effects. Fixes appearance of tabs on Region and Zone information windows, to match other tabbed windows. Moved the Region information window to appear in the same place as other info windows, and not overlap the TODO list. Fixes players getting stuck if they were pathfinding around the really wide roads that we used to have back around milestone 12.